I used Scotty rocket launcher type to hold umbrellas and patio umbrellas. They work great and are removable. Yeah, I'll stick my beach umbrella in a rod holder, but I personally don't see the need for the size & weight of a patio umbrella. But I also have a bimini top on the 16' skiff, sized so I can stand under it. Yes my dad lays one on its side and anchors off so the sun is to his back. 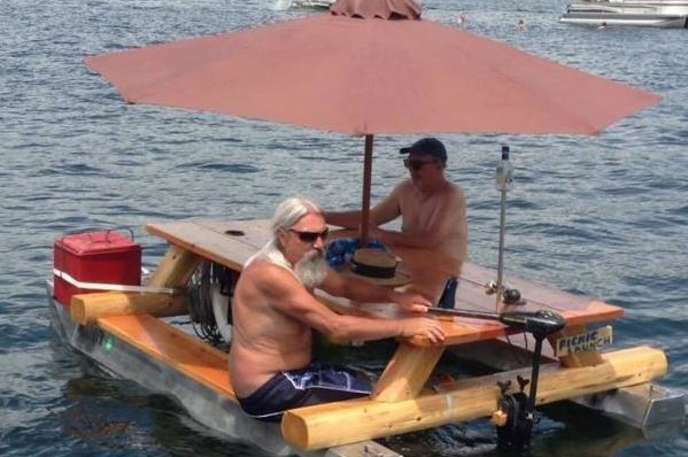 It works ok and he uses the patio seat cushion for the bench seat in the boat. Anything to be comfortable and get a little more time on the water. and he uses the patio seat cushion for the bench seat in the boat.. This never occurred to me and I have a couple in storage! "This never occurred to me and I have a couple in storage! " I used 4 pvc Ts and 4 pieces of pipe to make a big square, one side slips over my seat pedistal and the other holds the umbrella out far enough to allow my seat to swivel w/o hitting the umbrella pole. I have a cheap, tilting umbrella and it works pretty good to keep the sun off. I can also sit in the seat and cast/fish easily. I've used a patio umbrella in my last boat. I had to make an adapter sleeve to make the pole fit my vertical rod holder. I don't mind sitting in the sun. But my wife and son don't like to bake. So, I bring it for them. Works good and I only use it when we are not under way. sick all the next day. Steve - I got two beach umbrellas at Bass Pro. and a lot smaller than the standard patio style. It has an adjustable elbow to tilt in any position. of the holder - - - "case by case" when installing. Just DON'T forget to remove it before you take off from your fishing spot. I was idling from one spot to another just on the other side of a bridge. OOOPS and right in front of a riverfront restaurant. oh well at least they got a good show. I probably should have charged admission. Sounds like a Snap Chain would be in order. Do NOT attach it with a bungee....and then drive off....WHACK!!!!! Use a PVC frame and a cheap tarp, gives as much or as little coverage as you want.